government forces, all wrapped up with a touch of tongue in cheek humor. The Goliath Stone delivers a fun story with interesting philosophical and political musings. 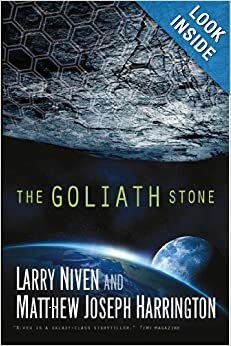 The Goliath Stone was written by Larry Niven (of Ringworld fame), and his co-author Matthew Joseph Harrington (where is your website Mr. Harrington?). It doesn’t have the galactic scope of Niven’s Ringworld or Man-Kzin Wars series. It all takes place within the solar system, and mostly on Earth. It nonetheless incorporates the larger theme of man’s earning to reach out beyond his current limitations. The plot is almost a backdrop to the authors’ philosophical musings. Normally, this would be a bad thing, but Niven and Harrington pull it off well. The story addresses questions about what it means to be human, the implications of creating a new sentient species, and the relationship a new species might have with its creators. It does so in a light, sometimes humorous, way that is mercifully not ponderous. There is one plot device in the book that annoys me. I’m sure there’s a proper literary term for this type of character, but I don’t know it. One of the characters, William Connors, is an impossibly adept master strategist. He can anticipate the moves of friend and foe 20 steps into the future. For instance, early in the book, the main character, Toby Glyer, is fleeing sinister government forces. At every step of his flight, Connors has friends already in place to assist Glyer and thwart the bad guys. Connors’ anticipation of others’ actions borders on precognition. There is nothing in the story that indicates Connors is, in fact, precognizant. The conceit is simply that he’s very, very smart. Outright psychic powers I can accept, though I prefer to see that sort of thing in fantasy novels, not science fiction. Individuals have a lot more freedom of action than chess pieces. People are sometimes irrational, they act against their own interests, they veer from their intended goal due to vagaries like boredom or hunger. I can’t see how someone, no matter how smart, could anticipate all these contingencies ahead of time. It reminds of the Foundation series by Isaac Asimov. His character, Hari Seldon, develops a new branch of science called psychohistory. Seldon doesn’t claim to anticipate the actions of individuals, but he does have the almost godlike power to predict the course of nations and empires. I find such marco level power of prediction as annoying as the micro level prowess featured in The Goliath Stone. In the end, however, my annoyance of William Connors’ almost omniscience was more than offset by The Goliath Stone’s many other fine qualities. I like asteroid/comet threat books, so the book’s cover drew me in. I also appreciated the book’s modest length. It’s only 312 pages. I thought this was unusual for Larry Niven. I think of him as a writer of epic science fiction on a galactic scale. However, skimming through his books in our catalog, I noticed he’s written a lot of books that are under 400 pages. Thank you Larry Niven. When I was a teen, I had the time and attention to plow through 400+ pages. I could keep track of dozens of characters and subplots. As a 40 year old father, I no longer have that time nor the powers of concentration to keep track of too many characters and subplots. The Goliath Stone is definitely worth the read. This entry was posted in Uncategorized and tagged asteroids, biotechnology, book review, human enhancement, human evolution, Larry Niven, Matthew Joseph Harrington, nanobots, nanotechnology, outer space, science fiction, technological singularity. Bookmark the permalink.